When I started putting together the soup for my partner Mary Shannon Hicks, I wanted to send her a good mix of beads and findings. I started with few yellow Jasper, an Agate oval and added couple of strands of fresh water pearls. Along came multicolored glass beads and crystals. And here is a small collection of pewter findings I added to the soup. For the focal and clasp, I added a hand and a flower clasp. I am very curious to see how Mary will use them in her designs, specially the hand. I have been trying to use the hand in one of my designs for some time but haven't been able to finalize on one. Hoping Mary's design will help me refine my ideas too. Mary found the soup beautiful and fun. Eagerly waiting to see her reveal on the party day. This year my partner for the Bead Soup Blog Party is Mary Shannon Hicks who is an excellent seed bead artist and loves to create beautiful designs. I was totally thrilled to see the soup Mary sent and my first reaction was wow! she sent me such an elaborate soup! It included obsidian, lava rock, cinnabar, howlite, pearls, agate, vintage beads and so much more. And look at the clasps, ear wires, findings and the lovely chain she sent. And here is the best part of the soup. The sterling wire wrapped focal. I am so touched that despite her recent eye surgery Mary took out time to create this special focal just for me. This is the first piece I am going to use in my designs. Thanks to Lori Anderson for creating these parties despite her long going illness and connecting beaders and jewelry artists across the world one bead soup at a time. Every year I look forward to Lori Anderson's Bead Soup Blog Party and have participated in four of them in the past few years. As Lori announced the details of the 8th BSBP few days back, the first thing I did was to put a reminder for myself. Glad that I just signed up for the party. This year the sign ups are for one day only and there is only one reveal date too. So if you are interested, don't miss the window to sign up. Its today only, Sunday February 9th. Lori Anderson, the creator of Bead Soup Blog Party, announced a new blog hop this year...the Bead Hoarders Blog Hop. 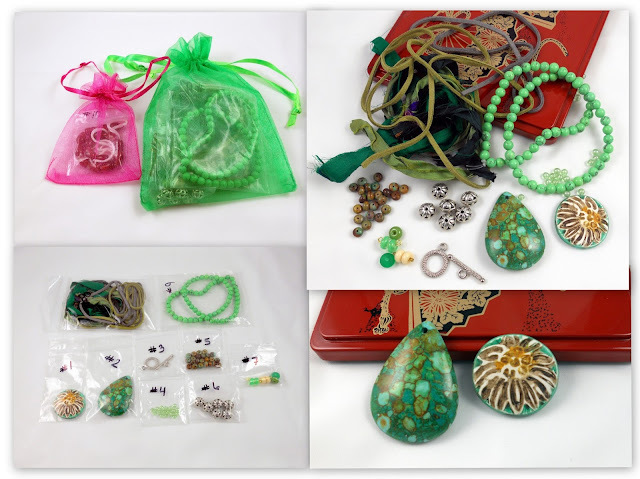 A great opportunity for the participating beaders to look into their own stash for beads that they have been hoarding for a long time but never got to use them, create beautiful jewelry pieces with them as part of the blog hop and share with all. For this blog hop no beads were swapped. Over the years, I have collected lot of semi-precious gemstones, pears and metal but due to many reasons haven't been able to spend as much time beading as I would love to do. This year I decided not to buy more beading supplies till I use at least 1/4th of what I already have. So the announcement of bead hoarders blog hop came at a right time for me. Also, my mother in-law is visiting me this summer who loves to bead with me. So as part of this blog hop, we together made few pieces, very simple still creative. Here are some of them. The first one is a necklace set with olive green ceramic rectangles with freshwater pearls. I really liked the simplicity of the necklace and the softness of the color combination. For the necklace below, I created half chain and use stringing for the other half. Black is one of my favorite color. Here I used black Onyx with metal beads and separators. Double strand Jade necklace with chandelier earrings. This one is my favorite with Pyrite stones. I am sure every participant must have created very beautiful pieces. Can't wait to see the reveal. Below is the list of participants. Last week I took some off from work and spent quality time beading. My parents in-law are visiting us this summer so had a wonderful time beading with my mother in-law who is always very interested in learning and exploring different kinds of craft. Here are couple of earrings that we made. We also made few new necklaces and fixed some old ones. After a long time I beaded for nine days in a row and it was so refreshing. 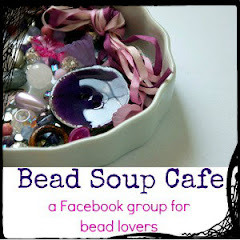 Today is the 3rd and final reveal of the 7th Bead Soup Blog Party organized by Lori Anderson. With each passing year, the party is getting bigger and the number of participants is increasing a lot. With over 500 jewelry makers across the world participating this time, the party had three reveals with amazing work displayed by very talented artists. 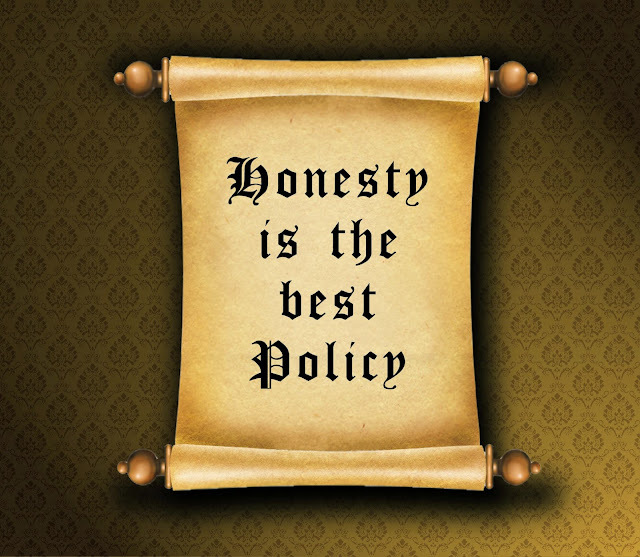 Originally me and my partner Lena Adams were a part of first reveal but with lots going on for both of us, we asked Lori to put us in the third reveal and Lori being her, always helpful and supportive, agreed and accommodated our request. Lena had sent me a very delicious soup. I have never used silk and leather before so I knew it will be interesting to play and design with them. When I started thinking of the design the first thing on my mind was Mosaic Aqua Jasper focal and I was so fascinated by the silk that I knew it has to be a necklace with it for sure. I created a dangle with a silver bead and green yellow glass beads over the focal and extended it with two flat silver ovals. As it was my first time to use the silk, I was not sure whether to use one strand or two and ended up almost tearing it when the necklace was in very last phases. I guess using two strands is better. I kept the original unfinished look of the dark green silk and wire wrapped four pairs of dangles to keep it simple. I was happy with the look of the necklace when I wore it and can't wait to show it off. Lena sent me two focal beads so with the second focal I came up with this necklace with spring colors. For this one, I used the silver toggle clasp and Jasper Turquoise beads from the soup and added few Carnelian, Agate and snowflake beads from my stash. 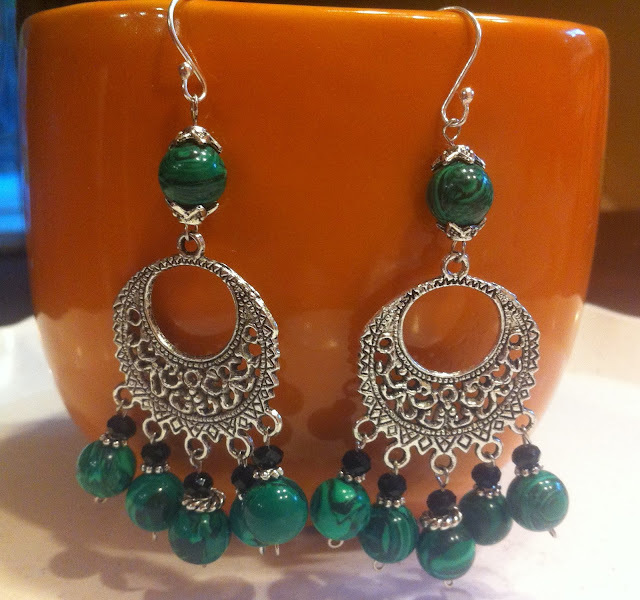 And here is the pair of earrings I made which can go with both the necklaces. I still have to come up with a design using the suede. Hopefully soon, I will share it with you. God has been testing Lori and Lena lately with illness/surgeries and many other difficult happenings in their lives. I really hope and pray that things get much better for both of them soon. Its my pleasure that I got to know them through these bead soup parties and I wish them good health and happiness always. Now its time for me to start blog hopping...will you come with me? I can't wait to see what Lena designed with the bead soup I sent her so let's start with her blog and then hop to the other participants.